Earning a college degree opens many doors that lead to better career opportunities and higher earnings. Additionally, children are more likely to earn a secondary degree of their own when their parents have attended college. An educated workforce is important to establishing 21st-century jobs to make Louisville competitive in the modern economy. 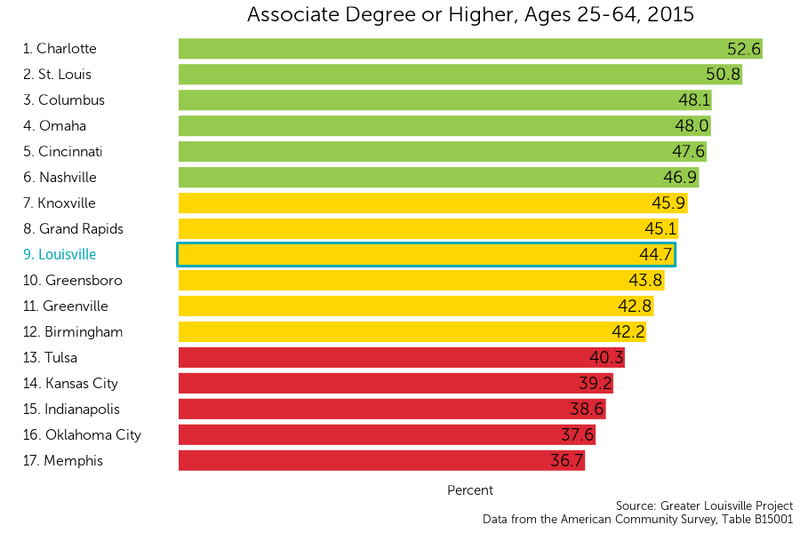 Louisville currently ranks 9th among its peer cities with 44.7% of working age individuals having earned at least an associate degree. High attainment of a post-secondary degrees is almost exclusively seen in eastern Louisville, among communities such as Northeast Jefferson, J-Town, and the Highlands , where the highest percentage reaches 84%. In comparison, western and southern Louisville communities earned fewer post-secondary degrees, with the lowest rate being 6% in Russell and Fairdale. Although Louisville consistently trails its peers, the percentage of adults in Louisville with secondary degrees has increased fairly steadily since 2006. the gap between Louisville and its peer city average has been halved from 3 percentage points to 1.5 percentage points. Despite the clear divide between eastern and western Louisville, compared to its peer cities Louisville is increasing at a higher, steadier rate than most. Louisville’s efforts to increase overall secondary educational outcomes are creating positive impacts on averages and are placing the city in the position to continue the upward trend for years to come.